Hunger is your enemy if you're trying to build a house, but what can you do if you're living right on site, and have little to no cooking facilities? 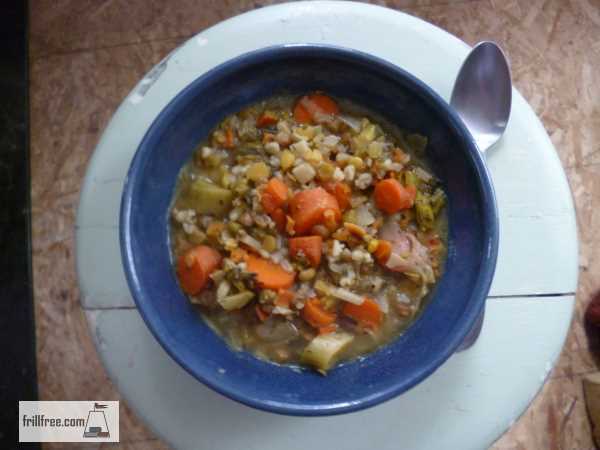 Planning ahead is a good way to put some homemade soup and other meal ingredients, ready to reheat in the microwave oven, into the freezer. I did a lot of semi cooked meals, like pre-baked chicken breasts, cut into pieces and refrozen in a yogurt container. I used these re-heated with freshly cooked noodles and a salad for a quick to prepare and tasty meal. Added bonus; few to no dirty dishes to wash up after. I just put everything in one bowl which was reserved for each person; a quick rinse in hot water and a dowsing in a 10% bleach solution is all that is required. Keeping meal preparation simple is crucial if you have a limited kitchen on your building site. Cooking over an open fire is one way to really get into the rustic lifestyle. Willow or other hardwood is the best wood to cook meals over; start the fire with any other kind of wood, then an hour or so prior to your meal preparation, put willow on - it's got to be dry and well aged for the best results. 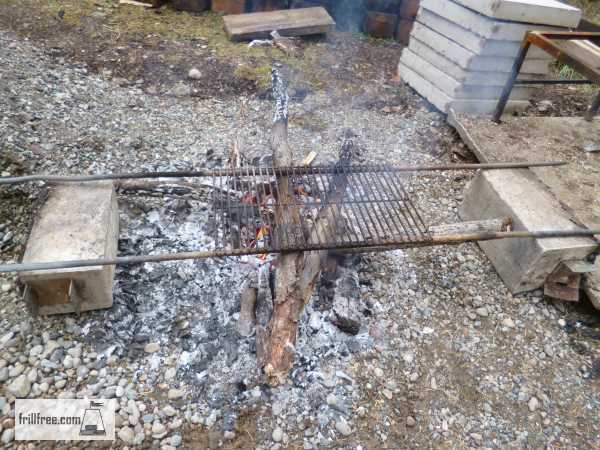 Once the wood has burned down to coals it's time to put the grill on to heat; ours is a barbeque grill attached with tie wire to two long ground rods. The important parts of our kitchen facilities are a freezer, small fridge, a microwave oven, coffee maker and the wood fire. Other things that were used to a much lesser extent are a two burner electric cooktop. electric toaster, electric slow cooker and other small appliances. Some of the ingredients for best success in cooking outdoors are surprising. 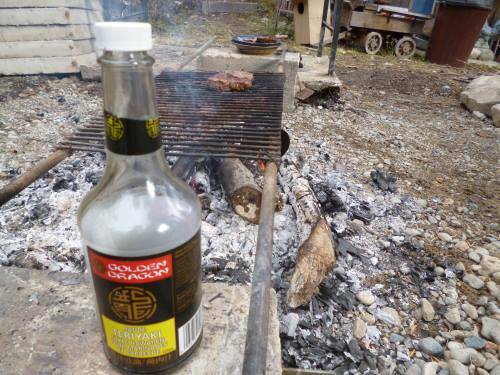 Marinating steaks in my all time favorite Golden Dragon Teriyaki Sauce has been a time saver and given me a reputation as a master griller. You can imagine my disappointment when they discontinued it - see my hack. Even after we had moved into our little house, there was a long period of time before we moved the range in. 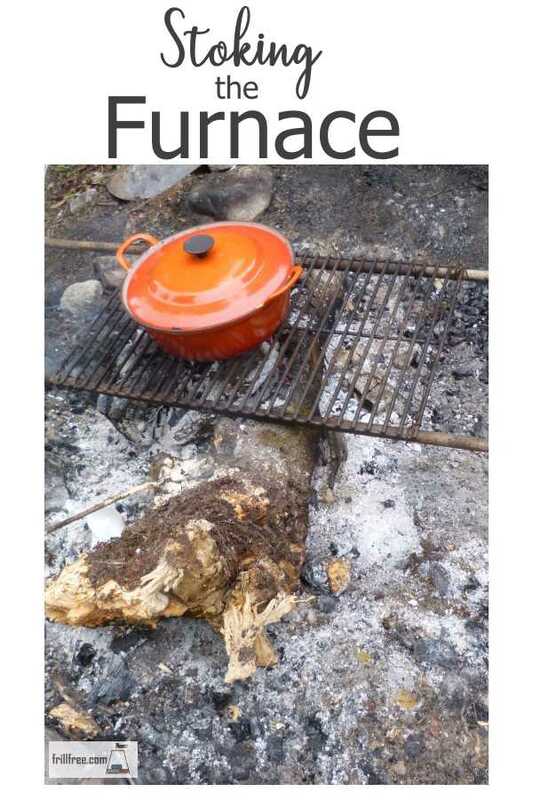 This meant learning to cook on the wood stove; I have a confession to make; even with an electric range, there are times when I choose to cook over the wood stove; it's free heat after all, and with my trusty pressure cooker, I can make spaghetti sauces and soups that have no equal, in less than half the time. Keeping the building crew happily fed can mean the difference between a grumbling bunch of slackers and an energetic group of tight knit workers. Feed them well, and they'll come back, even if they are volunteers. Lots of barn raisings were accomplished with little more than a good pot luck meal, usually provided by the wives of the guys who were doing the work; getting a good head of steam to really accomplish a lot was dependent on how well they were fed. The trick is to feed only things that will stoke the furnace without inducing a stupor - nothing gets accomplished if the workers just want a snooze!